The momentum of summer winds down after the Fourth of July. Once August hits, you can’t escape the sense that the season is over, and so is the party. But no summer can be complete without Minneapolis’s Uptown Art Fair, Loring Park Art Festival, and Powderhorn Art Fair, all taking place the first weekend in August. The three are connected by free transportation circuiting among them. No better way to spend a sunny afternoon than strolling block after block of quality artwork that could spruce up your house, yard, or wardrobe. The Uptown Art Fair gets under way Friday, August 7, a day earlier than the Loring Park and Powderhorn events. Attracting an average of 375,000 visitors a year, it is second only to the Minnesota State Fair in statewide attendance. The fair enters its 46th year with high honors, as it has won more than 70 International Festivals and Events Association (IFEA) Pinnacle Awards. It is rated eighth in the country by Art Fair Sourcebook, in part because of the highly competitive juried selection process. This year’s theme, “A Fusion of Art, Flavor, and Flair,” mates global flavor with the personality and charms of the Uptown area. After perusing limited editions and one-of-a-kind artwork, visitors can enjoy live entertainment at the CBS Outdoor Performance Stage, this year graced by musicians and dance groups like Urban Traveler Japanese Dancers and Renaissance Belly Dancers. Families can create their own art at the Family Imagination Station. The Loring Park Art Festival kicks off its 10th anniversary on August 8, with 140 artists, as well as strolling musicians, visual art, and performances onstage, all brought together by Minneapolis-based Artists for Artists LLP. The festival is hosting the Iraqi and American Reconciliation Project (IARP) and its Iraqi Art Project inside the main park building. This group works to promote reconciliation between the people of the United States and Iraq in response to the devastation affecting Iraqi families, society, and culture. Unrest in Iraq has made it more difficult for artists to display their work at home. Live entertainment features musician Michael Monroe and the Open Eye Figure Theatre, as well as a choir of Target employees called The Spots and a hand bell choir from St. Albert the Great Church. 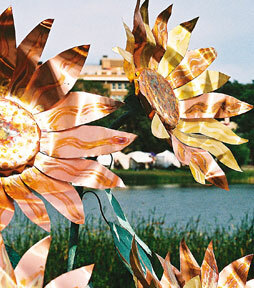 Children’s activities include hands-on art making sponsored by the Minnesota Institute of Arts. Now in its 18th year, the Powderhorn Art Fair enchants fair-goers with high-quality art, live acoustic music, food, and family activities. Booths arranged to encircle Powderhorn Lake make the most of the 66-acre park’s natural scenery. With more than 180 artists represented, an array of disciplines is represented, ranging from painting, sculpture, print-making, and photography to mixed media, jewelry, wood, and glass. A Community Showcase and Group Exhibitors of the Powderhorn Park area also will be spotlighted. Art lovers will be able to enjoy a variety of artists, locations, and cultures that contribute to the diversity of Minneapolis neighborhoods. The event is a collaboration between the Powderhorn Park Neighborhood Association and the Minneapolis Park and Recreation Board. Like the Uptown Art Fair and the Loring Park Art Festival, money raised from the events goes back to the community. Proceeds from the Powderhorn Art Fair help fund park programs like theater arts, team sports, and a teen center.